Scottish Broadsword - The traditional weapon of the highland clansman, this sword has sown fear into the hearts of Englishmen for centuries. Its long, two-edged blade and distinctive basket hilt, when combined with targe and dirk has proven to be more than a match for enemy soldiers on battlefields the world over. Now Cold Steel® has chosen to make our own replica of this famous weapon. Our double-edged blade is hand forged and beautifully polished with triple fullers. 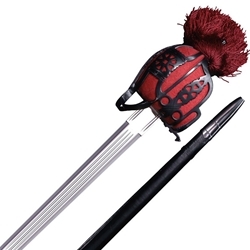 The stout basket hilt is made of blued steel with a wood grip covered in ray skin and decoratively wrapped in wire. Each broadsword will pass the stringent British Proof test and comes with a wood and leather scabbard that’s complimented by blued steel chape and throat.